A weak cold front resulted in light to moderate falls in southeast Australia at the start of the week, broad surface troughs across northern Australia produced thunderstorms and showers with moderate falls. Past seven days: Moderate rainfall was mainly recorded in the Kimberley and eastern parts of the Southern Interior of Western Australia; the northern half and southwest of the Northern Territory; western and central to southeastern Queensland; parts of central and eastern New South Wales; eastern Victoria and parts of central and eastern Tasmania. Scattered, light falls were recorded in all States and Territories. In the first part of the week, a cloudband with embedded thunderstorms extending from the Gulf Country in the Northern Territory, through western Queensland to southeast Australia moved southeast off the New South Wales’s coast, in association with a broad trough. A cold front tracked across southeast Australia in its wake. Another cloudband developed in the Northern Territory’s north and east. Moderate falls were recorded in the Kimberley; the northwest, and central to eastern parts of the Northern Territory; and in western Queensland. Moderate falls were also recorded in parts of eastern South Australia, central and southeastern New South Wales, eastern Victoria and parts of southern Tasmania. Widespread light falls were reported through northeastern South Australia, western New South Wales and central to eastern Victoria. 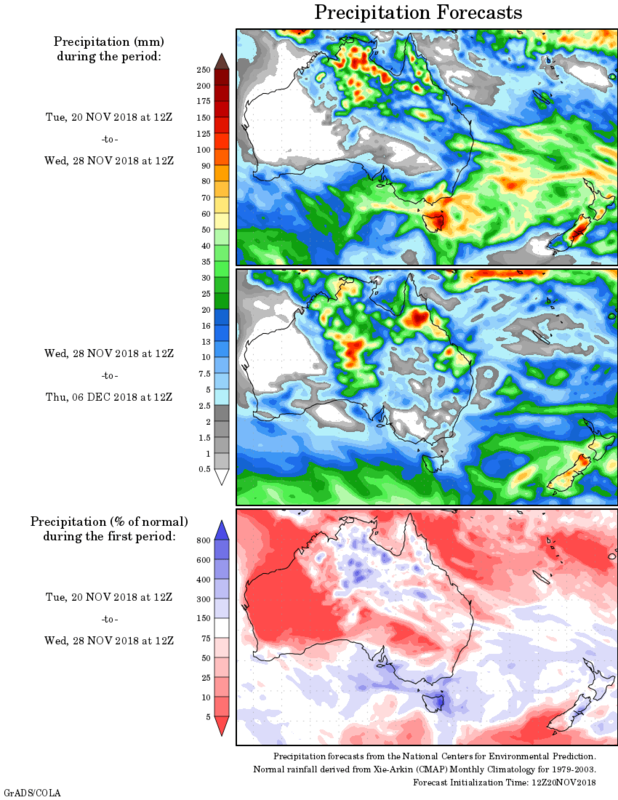 In the second half of the week, a trough of low pressure off the northern coast of New South Wales combined with an onshore flow, producing showers and storms with moderate falls along the east coast of New South Wales. A broad low pressure trough extended from the north down to the southwest of Western Australia. Thunderstorms and showers developed in isolated parts of the south and north of Western Australia; also around the Top End and northwest of the Northern Territory and the Gulf Country. Another surface trough stretched from the northwest of Queensland, though the State’s central interior to northeastern New South Wales. Severe thunderstorms developed through central and southeastern Queensland, and northeastern New South Wales, with moderate to locally heavier falls recorded. Rainfall totals exceeding 50 mm were recorded in the northwest Top End of the Northern Territory, isolated parts of northwest and central Queensland, and an area in northeastern New South Wales. Falls in excess of 100 mm were recorded around the Darwin-Daly district in the Northern Territory, including the highest weekly rainfall total of 212 mm at Adelaide River Post Office. Rainfall totals between 10 mm and 50 mm were recorded in parts of the Central Interior and across most of the Kimberley in Western Australia; in the southwest and most of the northern half of the Northern Territory; western and central to southeastern Queensland; areas in the southeast and along the east coast of New South Wales; eastern Victoria; small areas of central and eastern Tasmania, and a small area in eastern South Australia. Little or no rainfall was recorded along the southwest coast, the Pilbara, Gascoyne coast and southeast of Western Australia; most of the southern half of the Northern Territory; northern Queensland; most of South Australia; western Victoria and the northwest of Tasmania.